・Be sure to kill the crossbow hollow before going down the stairs. ・Go along the walkway with enemy dogs and hollows and go up the stairs. 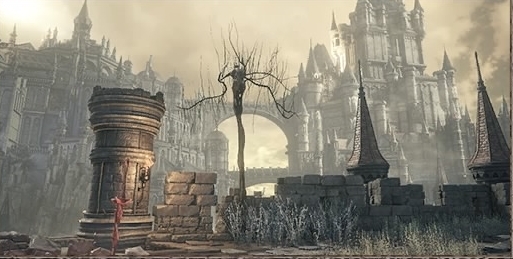 ・On the smaller tower there will be hollows praying as well as crossbow hollows. One of the hollows will turn into a Pus on Man if not killed quickly. Once killed after turned, it will drop a Titanite Shard and an Ember. ・Longbow and Standard Arrow can be looted in that area. ・Go down the stairs placed halfway through the walkway for Soul of a Deserted Corpse. ・There is a door for a shortcut but can’t be opened yet. ・Light High Wall of Lothric bonfire. ・Soul of a Deserted Corpse on the walkway. ・Go up the stairs leading to a dragon corpse and continue up the stairs for Binoculars. ・Drop down a ledge by the dragon for 2 Gold Resin. ・Drop down into a room with a opening in the middle to loot 2 Firebomb. ・Take the ladder down for a Soul of a Deserted Corpse. ・Be aware as the dragon will breath fire on the area. ・You can loot an Claymore, Ember, and a Club from where the dragon had been breathing fire. ・Go inside the building where the dragon sits and you will find a mimic which will drop an Deep Batle Axe. ・Between the building where the dragon is and the building next to it lays a Soul of a Deserted Corpse. ・As you enter the building you can find 3 Firebombs on a beam to the right. At the bottom level you can find 8 Throwing Knife and a Mail Breaker. Go outside and take the stairs up for Tower on the Wall bonfire. You can find a Titanite Shard near by. ・Go outside from 2 levels below the bonfire to find Soul of a Deserted Corpse to your right. ・Once up on the roof with hollows praying loot for 3 Firebomb. One of the hollows will turn so it is best to kill it before happening. If killed after turned it will drop Titanite Shard and Ember. ・Explore the rooftop to find Large Soul of a Deserted Corpse and a Crystal Lizard. ・Take the ladder down and find 2 Firebomb and 3 Black Firebomb to your left. ・Go inside the building to your right. ・The pot in the left room wil hold 2 Undead Hunter Charm. Go further into another room for Titanite Shard. ・On a table you can find a Soul of a Deserted Corpse. ・Loot for a Broadsword in the room where the hollow jumps at you hides. ・Right as you wall through the hall with the table go left for 2 Green Blossom. Jump down from the walkway to the right by destroying the barrels to find an Astora Great Sword. ・Continue down the stairs where you can find a sitting hollow and open the chest for a Silver Eagle Kite Shield. ・After going all the way down, you can find a Estus Shard on a table. Go down the stairs near by to find a Cell Key. Destroy the barrel near by the stairs for a Titanite Shard. ・As you go down the courtyard with a fountain in the middle you will come across a large knight wielding a halberd. He attacks have a wide range but not so difiicult to dodge. Using backstabs is very effective against him. In the courtyard you can find 2 Ember and a Rapier. ・Pass through the gate and to your left you can loot a Soul of a Deserted Corpse.Go up the stairs to your right onto a roof where to find a Ring of Sacrifice and a Soul of a Deserted Corpse. ・Go further up the stairs until you come up a walkway to find Green Blossom to your left. ・Go up the elevator to unlock the door for the shortcut. ・At the top you will find 6 Throwing Knifes. ・Go down the left stairs placed at the courtyard with piles of dead corpses. ・Go up the stairs in front for a Lucerne. ・There will be a red eye knight which will drop a Refined Gem if killed if you go up the left stairs. ・Go into the building where you will find Emma. Talk with her to recieve Samll Lothric Banner. Talk to her again for the Way of Blue convenant. ・Go down the stairs on the opposite direction and go through the fog wall to fight with Vordt of the Boreal Valley. ・You can find Sword Master Saber’s summon sign if front of the boss area. ・Defeat the boss to obtain Soul of the Boreal Valley Vordt. ・Proceed through the opened door to get to a cliff. ・After he loses half of his HP, he will start to use ice breath while charging. ・Going under his body is a good strategy as you won’t take most hits from his attacks so try gurading or dodging to go under. ・Gurading his slash attack uses lot of stamina so it is best to dodge it. ・From the Tower on the Wall bonfire, make your way down the stairs to find a NPC locked in the cell. ・Use the cell key to open it. ・Talk to Greirat of the Undead Settlement and accept his request to recieve the Blue Tearstone Ring. ・After obtaining 1 Pale Tongue and defeating the Curse-Rotten Greatwood, talk to Leonhard and he will give you a Lift Chamber Key. ・From the Tower on the Wall bonfire, go down the building using a ladder and open the locked door with the key you recieved. ・As you go down the rift, you will find the Darkwarith. Defeat him to obtain the Red Eye Orb. Once you obtained the Red Eye Orb you can kill him again for Darkwrith Equipments.